Imagine, if you will, that a trilogy could represent a three course meal. Part one is the appetizer that gets you started, part two is the main course, where it can have fun without having to wrap anything up or start anything new, and part three is the dessert, the sweet stuff that gives us something to go out with. The Hunger Games: Mockingjay – Part 1 is 123 minutes of whipped cream and cherries. I mean, it’s good whipped cream, but it’s still just whipped cream. Part 2 will be the rest of the final course, and will have more substance and present a hopefully satisfying conclusion to this billion-dollar movie meal that has swept multiplex screens for the past few years. But by splitting Suzanne Collins’ final novel, Hollywood is once again sending the same money-first message they have done for just about every other successful series of “young adult” novels turned into films. As a result, this movie is seemingly 95% buildup. It is, however, well made buildup. 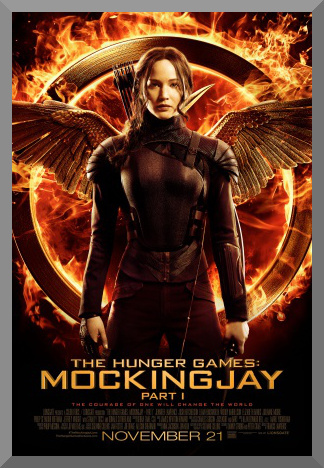 The film opens following the end of its predecessor, Catching Fire, where we learn that Katniss Everdeen’s (Jennifer Lawrence) home of District 12, Panem, has been destroyed following the 75th Hunger Games. She has been taken to District 13, a part of the nation previously thought to have been wiped off the map. Its president, Alma Coin (Julianne Moore) and former Hunger Games administrator Plutarch Heavensbee (Philip Seymour Hoffman) have decided that Katniss would be the best candidate as the figurehead of a growing revolution to overthrow the corrupt Capitol, under the near-dictatorial leadership of President Snow (Donald Sutherland), and star in propaganda videos to be broadcast across the nation. Her friend and potential love interest Peeta Mellark (Josh Hutcherson) is now in the Capitol District, promoting a different platform, regularly appearing on television advocating an anti-revolution stance. Katniss will only agree to Coin’s and Heavensbee’s request under a few conditions, namely that a few victors in the Capitol, Peeta included, be liberated to District 13 at the nearest opportunity. Her demands are eventually agreed to and Katniss is launched into the world of the brewing revolt, with the pressure of both sides creeping in closer and closer on her as tension begins to boil over. Mockingjay – Part 1 has an interesting focus on the power of political propaganda, and the effect it has on a movement. Katniss is followed around by a documentary crew that create the clips which rouse up the rebel movement, while the Capitol attempts to crush at every moment. A scene where these two aspects overlap, when an overcrowded hospital is bombed by the government while right after Katniss and the production team film there, is one of the movie’s most engaging sequences. The film’s general competency in holding the viewer’s attention stems from handling its approach to its subject matter in a consistently intelligent way. The Hunger Games, along with Christopher Nolan’s The Dark Knight trilogy, has provided some of the bleakest and most complex worldviews one is likely to find in a major PG-13 blockbuster franchise. And for the movie’s case, it once again has a cast that recognizes the relative weight of the material provided and as a result, deliver impressive performances. Jennifer Lawrence has consistently won over viewers in every successive entry in this series, and here might be her most layered turn as Katniss Everdeen yet, as her character must deal with being a key player in a massive movement that could permanently change the entire status of a nation. Josh Hutcherson’s Peeta is also given more material to cover, and the actor approaches it with skill. Also in the cast, new to the series, is Julianne Moore as President Alma Coin, who brings more established talent to a supporting cast that already contains people like Philip Seymour Hoffman (in what I believe was his last movie), Donald Sutherland, and Woody Harrelson. Moore portrays Coin with a sturdy degree of authority, with the ever-present hint that there’s a lot more to the character than what is seen on the surface. Maybe now you’re a bit confused. Since I finished the plot synopsis, I’ve done nothing but heap praise on the movie, even though there is a star rating standing at two-and-a-half. And I’ll confuse you a little more, by pointing out the strengths of the film’s great special effects and set design, which portray Panem’s vastness, diversity, and in multiple cases, destruction and disarray. But to my point, the reason Mockingjay – Part 1 leaves you with a strong undercurrent of dissatisfaction is perhaps the most obvious one – the “Part 1” in the title. It isn’t just me or other reviewers that feel this way, as this complaint has circulated all over message boards and was the general consensus among the handful of friends I saw the movie with. Collins’ book isn’t any longer than the previous two in the trilogy, and instead of biting the bullet and making a big, sprawling adaptation, everything feels like a preview for Mockingjay – Part 2, building to a climax that’s one year (and another ten dollars) away. It’s amazing how needless extension can make an otherwise well done movie feel so incomplete. When it comes to a close, the conclusion feels entirely perfunctory, and a little bit frustrating, as it is at a crucial point where the story’s momentum is just about to start up again. It’s not the fault of anyone in the cast or crew that Mockingjay – Part 1 feels this way, but the nature of the beast that rules over it. Maybe when all is said and done with the series next year, this movie will feel fuller, but right now it is the unfortunate victim of unwritten industry rules, providing part of what may indeed become in the end a more fleshed out four hour finale, but at the cost of needlessly dragged-out filmmaking, a full-price presentation for half of a story.